When it comes to selecting entertainment for your special day, you have two main options: a wedding DJ or a live band. While the choice is entirely up to the couple, there are many valid reasons why DJs have become the go-to decision for receptions. If you’re planning your nuptials and are trying to decide on the right entertainment option for you, take a look at the helpful information below. Do You Want an Unlimited Range of Music? Many couples like to have a broad range of music played at their wedding reception. From lively hits that will get guests out on the dance floor to subdued selections for the end of the evening, it’s a good idea to have some different styles of music played throughout the evening. 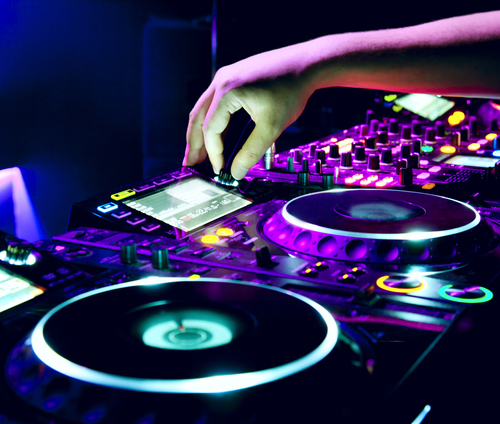 DJs can play virtually any song from any artist, and if you’d like, they can even take requests at the reception. With bands, you’re locked into their musical repertoire. Are You Seeking More Than Just Music? DJs don’t just provide the music; they can also host your entire event. In fact, most DJs offer full emcee services and will be happy to make any announcements you need. From spreading the word about the cake cutting to introducing your wedding party, your DJ can add a bit of liveliness to the must-have elements of your wedding reception. Most bands may only provide music. Your DJ can also ensure your guests are having a good time by gauging the mood throughout the evening. If they need to get guests up out of their seat, they might even hold fun DJ games — with your approval, of course — or play some hits no one can resist. They can even incorporate audiovisual equipment into your reception if you wish to share a compilation of special memories, which far surpasses the services offered by most bands. Hiring the right DJ for your wedding can make the day that much more special. If you’re planning to get married in the Cincinnati, OH, area and are seeking the region’s best wedding DJ, look no further than Party Pleasers Services. With a full line of services, including DJs and photo booth rentals, this team of party experts has all of your entertainment needs covered. Learn more by visiting their website, or call (513) 417-8316 to discuss your event with their attentive team.